LUIS SUAREZ WILL have to watch Liverpool’s final game of 2011 from the stands after he was handed a one-match ban for his middle finger gesture towards Fulham fans last month. Suarez, who looks set to appeal his eight-game suspension for making racist comments towards Patrice Evra, pled guilty to a charge of improper conduct following Liverpool’s 1-0 defeat at Craven Cottage on 5 December. The Uruguyan striker was booed and jeered by the home support throughout the game but found himself in hot water when photographers caught his angry response on camera as he headed down the tunnel. The one-match ban comes into effect immediately, ruling Suarez out of Newcastle’s visit to Anfield on Friday where Kenny Dalglish’s men will be hoping to bounce back from disappointing draws against Wigan and Blackburn in their last two outings. Liverpool have also been fined £20,000 and warned as to their future conduct for failing to control their players during the same fixture which sparked into life when Jay Spearing was red carded by Kevin Friend for a late tackle on Moussa Dembele. The club admitted the charge but failed to accept the standard penalty which was imposed by an Independent Regulatory Commission hearing nonetheless, the FA said in a statement this morning. Clint Dempsey scored the game’s only goal five minutes from time, bringing an end to Liverpool’s eight-match unbeaten run in the Premier League. Email “Suarez hit with 'improper conduct' ban for Fulham gesture”. 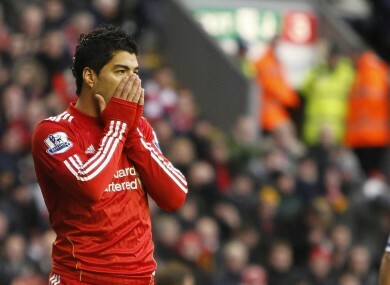 Feedback on “Suarez hit with 'improper conduct' ban for Fulham gesture”.